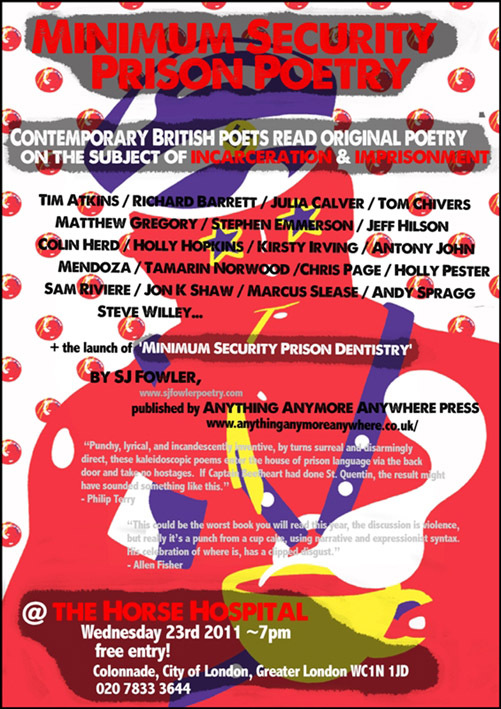 Contemporary British poets read original poetry on the subject of incarceration & imprisonment. Tim Atkins / Richard Barrett / Julia Calver / Tom Chivers / Matthew Gregory /Stephen Emmerson / Jeff Hilson / Colin Herd / Holly Hopkins / Kirsty Irving / Antony John / Mendoza / Tamarin Norwood / Chris Page / Holly Pester / Sam Riviere / Jon K Shaw / Marcus Slease / Andy Spragg / Steve Willey / SJ Fowler, launching the collection Minimum Security Prison Dentistry published by Anything Anymore Anywhere press. If you think poetry is some sedate pursuit carried out in an ivory tower then you obviously ain’t read Steven Fowler. He makes Bukowski look like Billy Childish and Billy Childish look like William MacGonagall!